Born into a family Donbass railway-workers originally called Dougal. Schooled in Ekaterinoslav (now Dnipropetrovsk) before entering the Kharkov Arts Institute in 1922, where he was influenced by Mykhailo Boychuk’s angular style – joining his Ukraine Association of Revolutionary Art in 1925. 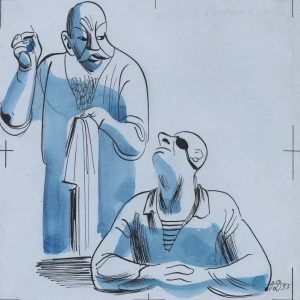 Taught at Kharkov Technical College from 1931-33 and produced a series of lithographs on the theme of Socialist Kharkov in 1936. Exhibitions of his work were held in Kharkov in 1946/1958, Kiev in 1958 and Chuguev in 1959. His post-war output as a book illustrator, in a conventional style bereft of his youthful panache, was prolific.